This week's episode of Wrestling Omakase sees us welcome a brand new guest, the King of Banter himself, Joe Lanza of the Voices of Wrestling flagship (@voiceswrestling)! It's tough for me to pin down an exact topic here: ostensibly the show was supposed to be about John & Joe's similar background in wrestling, mainly with ROH/DG/NOAH in the early-to-mid 2000s, but in practice we talked about all sorts of stuff in nearly two-and-a-half hours. 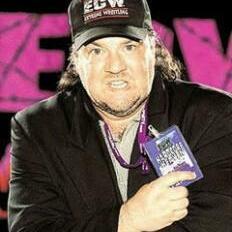 Joe talks about growing up with the WWF & WCW and why he continues watching WWE now, how much WWE he'd actually watch if he wasn't doing the podcast every week, getting into ECW during what most would describe as the glory years of the company and why he felt it worked so well at the time, tape trading and his early puroresu & lucha fandom, what it was like downloading shows off the internet early on, different puro websites John & Joe both frequented, and finally their memories of attending ROH shows during that company's glory period, watching NOAH during their glory years, and getting into Dragon Gate as well! Plus, we got a ton of questions sent in from Twitter followers of the Omakase account (@wrestleomakase) and we answer every single one of them, on everything from Hikaru Sato to full communism! All this and much more on a wide-ranging episode of Wrestling Omakase!